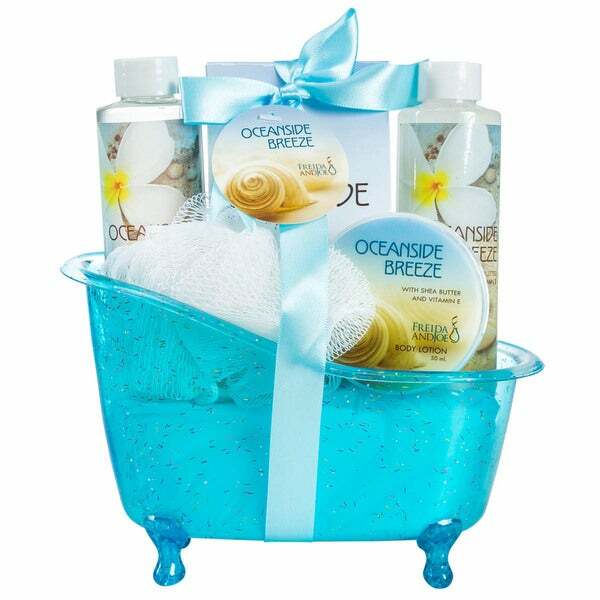 Show appreciation for a loved one by gifting this spa set, which includes shower gel, bubble bath, lotion, salts, and a puff. The set comes in a blue plastic tub that can be reused for storage or decoration. I gave these as gifts--and they were received very well. would recommend them to close friends!! Very disappointed. wanted bubble bath items and received lotions and soap I didn't want. Not a very good description on line. The tub is plastic and was broken and chipped. Not worth returning bigger hassle than keeping. Very small. This again is small but it is a great set and smells very nice and fresh. Perfect for a gift or yourself. I bought this for a gift and the person I bought it for like the soft smelling scent it gave, being that she is not into strong scents. The tub was adorable and everyone passed it around to get a good look at it. This was a birthday gift item and it was a big hit. Highly recommend this gift basket. Bought as Christmas gift. It was very nice that it was a pre made “basket”. Perfect gift! Exactly what I expected! Its pretty, a great price and great for giving in conjunction with other gifts. "where is this product made..in USA or china??" Hello JESS, this is made in China. Thanks for shopping with us! How to Choose the Best Hair Straightener for your Hair from Overstock.com. The key to optimum hair care and straightening without damage is choosing the best flat iron for your hair type.